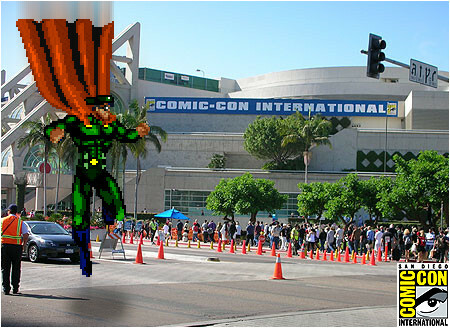 I-Mockery At The 2017 San Diego Comic-Con July 19th - 23rd! Come See Us At Booth #E10! New Game & Poster! 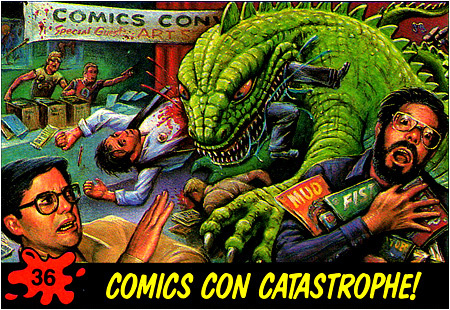 You too could experience the thrill of being mauled at Comic-Con! Between working on multiple projects, and getting ready for our annual "Two Months of Halloween", and now prepping for the 2017 San Diego Comic-Con, I've been insanely busy as of late. This will actually be I-Mockery's ninth time as an exhibitor, and I couldn't be more excited about what we have to showcase this year - not to mention seeing all the familiar faces (and new ones) who stop by our booth. Be sure to pay us a visit if you're coming to Comic-Con as we'll be at (Booth #E10 - near Aisles 600 & 700 on the West side of the convention center - here's a handy map). So what can you expect to see when you come by the booth? How about a graveyard! We're turning the I-Mockery booth into a small graveyard this year! You'll be able to walk right up to our humble cemetery and be one of the first people to ever play Grave Chase months before it hits Steam on September 20th! It's been a while since I've made a game with a Halloween theme, so getting to put out our first Steam game this fall has me absolutely thrilled. We'll also have some special souvenir Grave Chase cards and stickers for anybody who comes by the booth to try out the game. 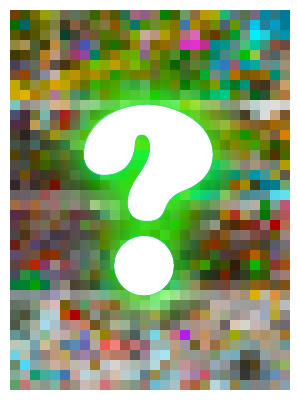 The other big news is that we've heard your cries, and we'll be unveiling our brand new "Four Seasons of Pixels Collection" pixel poster! A lot of people have asked Pox and I to put all four of our classic pixel posters onto a single print, especially since the originals weren't standard frame size and were only available for a short time. We've combined all four of them into a standard 18x24 print that none of you will have any trouble finding a frame for. Now you can finally have all Four Seasons of pixels framed in one place. Myself, Re, and some other pals will all be there at the table again this year, so if you're attending, please stop by and say hello! And yes, to those of you who've asked, we'll be more than happy to sign anything you buy (or any other weird things you bring to the convention for us to sign). We'll even sign your face if you remember to bring it with you. For those of you who can't come, we're sorry you're gonna miss it, but rest assured we'll still do our best to take as many photos of the convention as possible, though things got so busy I didn't even have a chance to post them online last year (again). Obviously, we're gonna be super-busy with the booth, so getting time away from it to take pictures is always tricky. Once I'm back in town from Comic-Con, I'll do my best to post them if I'm not too swarmed with work... but I'll also be gearing up for our annual "Two Months of Halloween" season, which takes precedence over the SDCC photos. I wish I had the kind of time I used to have to get those big SDCC photo galleries up, but the sheer volume of work I have currently makes it unlikely - and honestly, I'd rather work on fun Halloween articles for all of you to enjoy. Again, for those of you who've never been, I feel I need to once again remind you of a very important fact: despite the misleading name, the Comic-Con has MUCH more than just comic books. True, if you're a fan of comic books, you'll be in heaven, but if you're not that into 'em, there's still PLENTY for you to do. Over the years, the convention has basically become a mega-media event. The convention center is chock full o' the latest video games for you to test out, tons of movie promotions, toys galore, incredible costumes, and some truly amazing artists as well. If anything, comics have taken a backseat to all the other crazy things going on at the convention. So yeah, the name is really misleading to some people, and that's unfortunate because they have no idea what they're missing out on. Be sure to keep an eye on the I-Mockery Twitter, I-Mockery Instagram, and I-Mockery Facebook pages throughout the week. As always, I'm gonna be super busy, but I'll do my best to update them with fun photos and news from Comic-Con whenever I have a chance. Alright, that's all for now. Wish us luck, cuz this is gonna be one hell of an insane week... again! I'm going to enjoy it vicariously!! Hello, will this 4 Seasons poster be available soon? By Christmas? Previous post: My Return To Movie Fights! Next post: Comic-Con Wrap-Up & TV Fights!